On March 12, 1877, in Nice during a solemn opening of St. Peter’s Youth Center in the new quarters of the Patronage de Saint Pierre, Don Bosco gave an address. For many reasons it was important that the event should go well; for this reason, Don Bosco took as his subject-matter his system of education, to which he had begun to give the title “Preventive”. Upon Don Bosco’s return to Turin, he had his address written up in more polished form, with also a French translation: he had spoken on the occasion itself in a mixture of Italian and French. It underwent various re-editing. 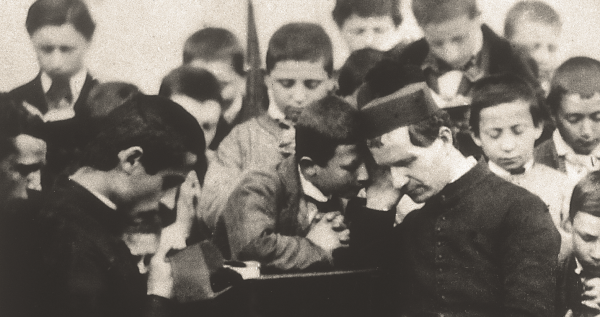 Originally published together with the account of the solemn opening – it began life essentially as a propaganda document – it eventually acquired a life of its own, representing as it does Don Bosco’s only attempt at setting out his educational principles in systematic form. On a number of occasions I have been asked to express, verbally or in writing, a few thoughts concerning the so-called “Preventive System” which we are accustomed to use in our houses. Until now I have not been able to comply with this request for lack of time, but since at the present moment we are preparing to print the regulations, which now have been observed as it were by tradition, I have thought it may be fitting to present here an outline of it, which will serve as a sketch for a small work which I am preparing, if God will give me life, long enough to complete it. I do this solely to help in the difficult art of educating the young. Therefore I will speak about in what the Preventive System consists and why it should be preferred; its practical application and its advantages. The practice of this system is all based on the words of St. Paul, who says: Love is patient, love is kind it bears all things … hopes all things, endures all things. (1 Cor. 13:4.7 passim) Love is kind, and patient; it puts up with all things, but hopes all things and endures any disturbance. For this reason only a Christian can successfully apply the Preventive system. Reason and Religion are the means the educator should constantly make use of, teaching them, making use of them himself, if he wishes to be obeyed and to attain his goal. [footnote] ** Not long ago a minister of the Queen of England, visiting an Institute in Turin was taken to a large hall where about 500 boys were studying. He was not a little amazed at seeing so many children in perfect silence, with no supervision. His amazement grew even more when he came to know that perhaps in an entire year, one did not have to complain of a word being said out place, or so much as threaten a punishment, much less inflict one. “Tell me, however is it possible to obtain such silence and such discipline”, he asked. And he added to his secretary, “Write down whatever he says”. “Sir”, replied the Director of the establishment, “the means we use is not available to you.” “Why?” “Because they are secrets known only to Catholics”. “What are they?” “Frequent Confession and Communion, and Daily Mass well heard.” “You are absolutely right. We lack these powerful means of education.” “If you do not make use of these religious means, you must turn to threats and the stick”. “You are right! You are right! Religion or the rod, I want to recount this in London”. 4: To strike one in any way, to make one kneel in a painful position, to pull any one’s ears and similar punishments should be absolutely avoided, because they are forbidden by the law of the land, they greatly irritate the young, and they degrade the educator.